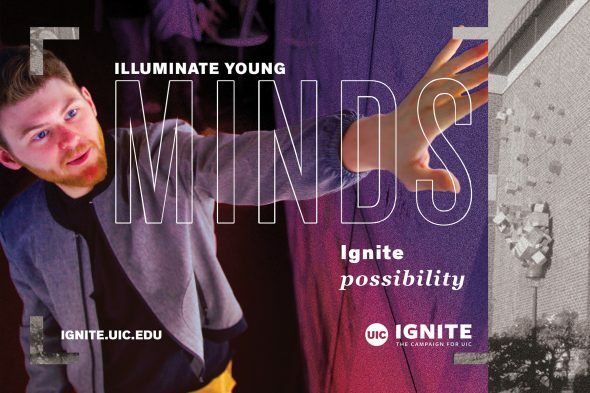 Nearly 700 donors raised $117,928 for UIC during IGNITE Giving Tuesday. Donations were accepted online last week in honor of the Giving Tuesday global holiday. Donations will support a larger campaign called IGNITE, which aims to raise $750 million over five years to advance UIC. “Giving Tuesday demonstrates the tremendous collective power of giving at UIC,” Nearhoof said. Through IGNITE, the university will raise funds to provide student scholarships, support new endowed faculty positions to retain and attract top scholars and researchers, equip faculty with the latest technologies for teaching and research, and build new facilities to improve the physical infrastructure of the campus to meet the growing needs of students and the community. The campaign, which will continue through 2022, will also fund research in key areas of excellence such as the human brain, social disparities, urban infrastructure, and functional and regenerative materials, and develop programs and partnerships to advance global health.